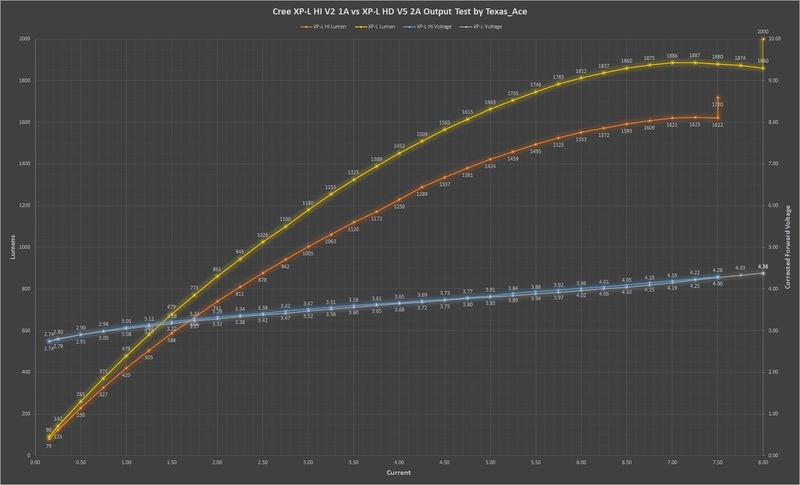 XP-L HI 1A V2 LED Output test by Texas_Ace, Well, you have seen the HD, this is the HI. It is exactly what you expect. See the title, it is another test. do I really need to explain this everytime? I abuse an LED and see what it does, same as all the rest of my victims subjects. Thanks to CRX for donation. Well, you have seen the XP-L HD test, so here is the HI. It tracks exactly the same as expected, just less output from the lower bin. I could have kept pushing it harder but I saw no reason to blow it. The numbers could be a tad low in the high end as my heatsink fan is messed up and I had to rig something up for these last tests that is possibly not quite as good. It is not more then a few percent though if anything. Thanks TA. Again invaluable info. 250lm loss at 5.5A, didn’t expect that! I have lots of lights modded with XP-L HI V2 1A and always assumed they made at least 1,600lm, I guess not. It makes sense as they are 4 bins lower then the V6, which is 28% less output according to the datasheet. It actually does better in this test then the datasheet would have you believe. It is only about 15% lower output where it should be closer to 21%. So either the V5 was on the low side of the bin or the HI was on the high side. Has anyone else gotten really high throw numbers from the XPL HI V2 1A? This emitter was one of the first ones I got from mtnelectronics when I started modding. Here I was measuring the throw in a UF 1504 and got 432Kcd. Today I was playing around with the 1504 and put a dedomed XPL V6 1A. Using a fully charged 30Q and measuring the throw at around 20s, I got 369Kcd with the XPL V6 and 383Kcd with the XPL HI V2. My dedomed XPL V6 measurement is consistent with the measurement here. So do other XPL HI V2 1As perform really well or is mine an exception? I haven’t used this emitter much because it’s a bit too blue for my liking, but I did measure the same emitter in a S2 with smooth reflector at 27.5Kcd at 30s, which is pretty high I think. 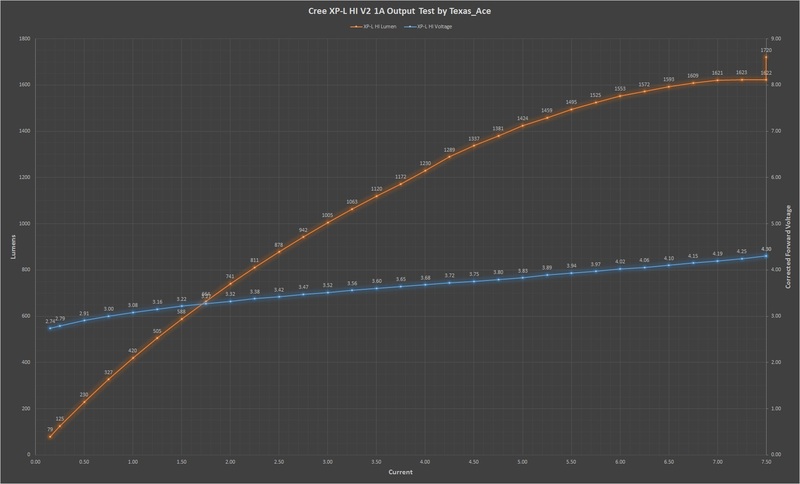 Mitko measured an XPL HI V2 1A in the BLF style budget thrower at 170Kcd, which is not high; in the same reflector I measured a dedomed XPL V6 1A at 243Kcd. Thanks for the testing TA. Now we need a dedomed XPL V6 tested. Unless you already done one? The XPL-HI sits about where i thought it would they do 5+ amps fairly easy in direct drive. I just got a XP-L HI V3 in 1B tint from Mountain Electronics and I installed it on my EagleTac TX25C2 driven by a FET driver and powered by a Sony VTC6 18650 and the thing is a blinding pocket hotrod! Generally a dedomed LED will have slightly higher throw numbers and a bit higher lumens then a HI LED but at the cost of CRI and tint. Personally I can’t stand dedoned LED tint shifts and loss of CRI.